Field effect transistor or FET is a transistor, where output current is controlled by electric field. FET sometimes, is called uni-polar transistor as it involves single carrier type operation. The basic types of FET transistor is completely different from BJT transistor basics. 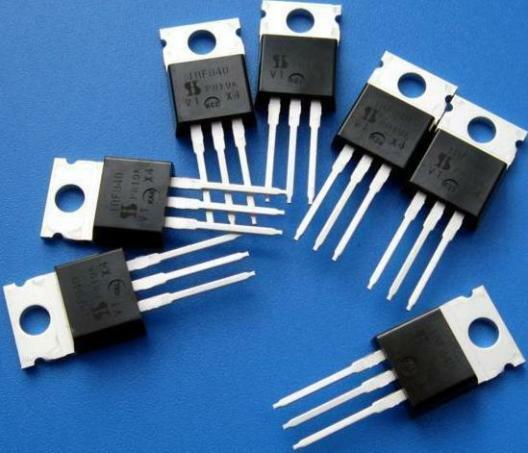 FET is three terminal semiconductor devices, with source, drain and gate terminals. The charge carries are electrons or holes, which flow from the source to drain though an active channel. This flow of electrons from source to drain is controlled by voltage applied across the gate and source terminals. FETs are of two types- JFETs or MOSFETs. The Junction FET transistor is a type of field effect transistor that can be used as an electrically controlled switch. The electric energy flows through an active channel between sources to drain terminals. By applying a reverse bias voltage to gate terminal, the channel is strained so the electric current is switched off completely. N channel JFET consists of an n type bar at the sides of which two p type layers are doped. The channel of electrons constitutes the N channel for the device. Two ohmic contacts are made at both ends of the N-channel device, which are connected together to form the gate terminal. The source and drain terminals are taken from the other two sides of the bar. The potential difference between source and drain terminals is termed as Vdd and potential difference between source and gate terminal is termed as Vgs. The charge flow is due to flow of electrons from source to drain. Whenever a positive voltage is applied across drain and source terminals, electrons flows from the source ‘S’ to drain ‘D’ terminal , where as conventional drain current Id flows through the drain to source. As current flows through the device, it is in on state. When a negative polarity voltage is applied to the gate terminal, a depletion region is created in the channel. The channel width is reduced, hence increasing the channel resistance between the source and drain. Since the gate source junction is reverse biased and no current flows in the device, it is in off condition. So basically if voltage applied at the gate terminal is increased, less amount of current will flow from the source to drain. 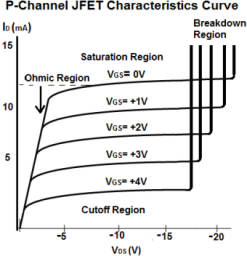 The N channel JFET has greater conductivity than the P channel JFET. So the N channel JFET is more efficient conductor compared to P channel JFET. 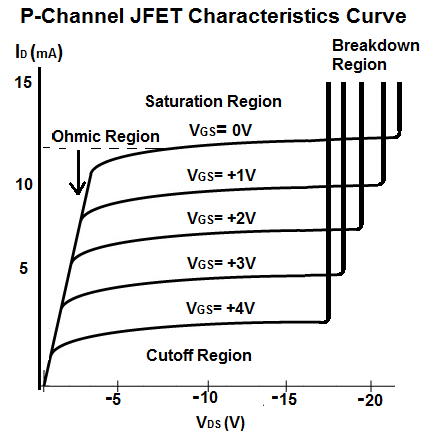 P channel JFET consists of a P type bar, at two sides of which n type layers are doped. The gate terminal is formed by joining the ohmic contacts at both the sides. Like in an N channel JFET, the source and drain terminals are taken from the other two sides of the bar. A P type channel, consisting of holes as charge carriers, is formed between source and drain terminal. A negative voltage applied to the drain and source terminals ensure the flow of current from source to drain terminal and the device operates in ohmic region. A positive voltage applied to the gate terminal ensures the reduction of channel width, thus increasing the channel resistance. More positive is the gate voltage; less is the current flowing through the device. Given below is characteristic curve of p channel Junction Field Effect transistor and different modes of operation of the transistor. Cutoff region: When the voltage applied to the gate terminal is enough positive for the channel width to be minimum, no current flows. This causes the device to be in cut off region. Ohmic region: The current flowing through the device is linearly proportional to the applied voltage until a breakdown voltage is reached. In this region, the transistor shows some resistance to the flow of current. Saturation region: When the drain source voltage reaches a value such that the current flowing through the device is constant with the drain source voltage and varies only with the gate source voltage, the device is said to be in saturation region. Break down region: When the drain source voltage reaches a value which causes the depletion region to break down, causing an abrupt increase in the drain current, the device is said to be in breakdown region. This breakdown region is reached earlier for lower value of drain source voltage when gate source voltage is more positive. 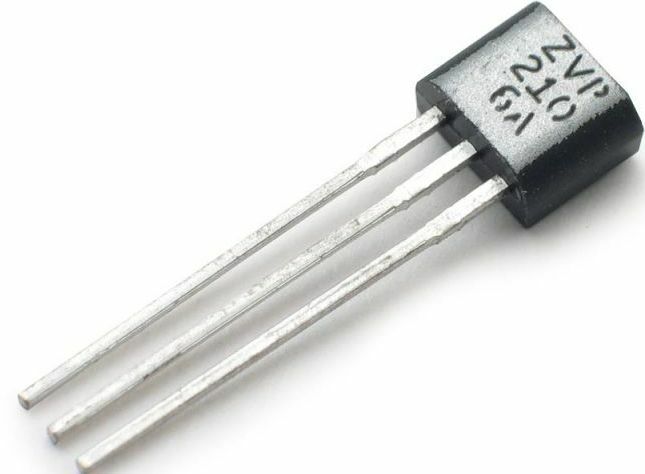 MOSFET transistor as its name suggests is a p type (n type) semiconductor bar (with two heavily doped n type regions diffused into it) with a metal oxide layer deposited on its surface and holes taken out of the layer to form source and drain terminals. 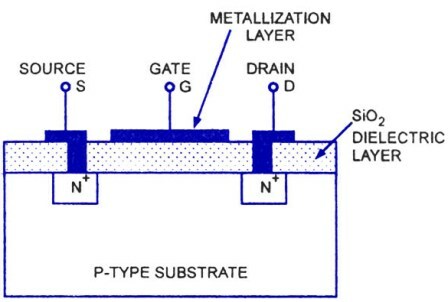 A metal layer is deposited on the oxide layer to form the gate terminal. One of the basic applications of field effect transistor is using a MOSFET as a switch. 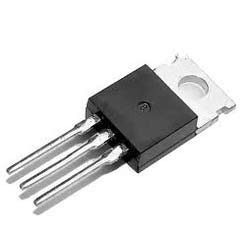 This type of FET transistor has three terminals, which are source, drain, and gate. The voltage applied to the gate terminal controls the flow of current from source to drain. The presence of an insulating layer of metal oxide results in the device having high input impedance. A MOSFET transistor is the most commonly used type of field effect transistor. MOSFET operation is achieved in two modes, based upon which MOSFET transistors are classified. 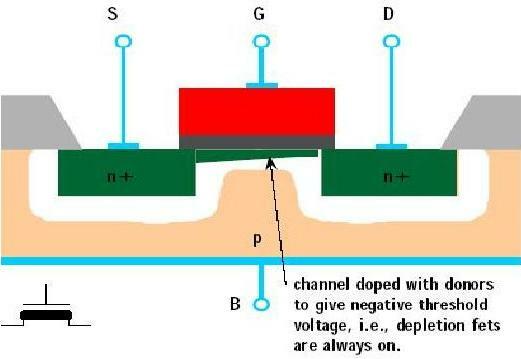 MOSFET operation in enhancement mode consists of a gradual formation of a channel whereas in depletion mode MOSFET, it consists of an already diffused channel. An advanced application of MOSFET is CMOS. When a negative voltage is applied to the gate terminal of MOSFET, the positive charge carrying carriers or holes get accumulated more near the oxide layer. A channel is formed from the source to drain terminal. As the voltage is made more negative, the channel width increases and current flows from source to drain terminal. 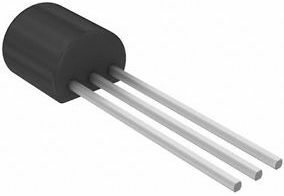 Thus as the flow of current ‘enhances’ with applied gate voltage, this device is called Enhancement type MOSFET. 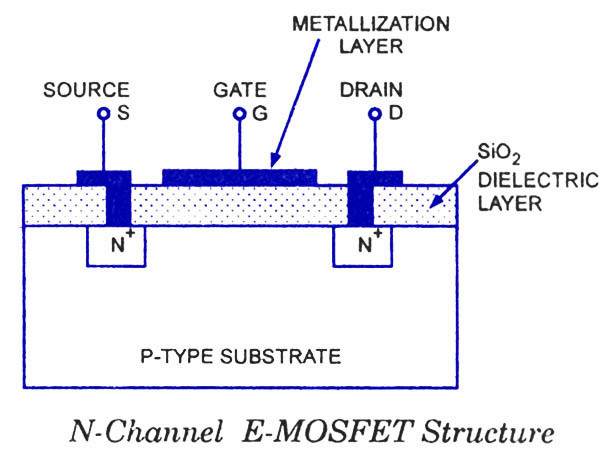 A depletion mode MOSFET consists of a channel diffused between the drain to source terminal. In absence of any gate voltage, current flows from source to drain because of the channel. When this gate voltage is made negative, positive charges get accumulated in the channel. This causes a depletion region or region of immobile charges in the channel and hinders the flow of current. Thus as the flow of current is affected by the formation of depletion region, this device is called depletion mode MOSFET. MOSFET can be used as a switch to operate a DC motor. 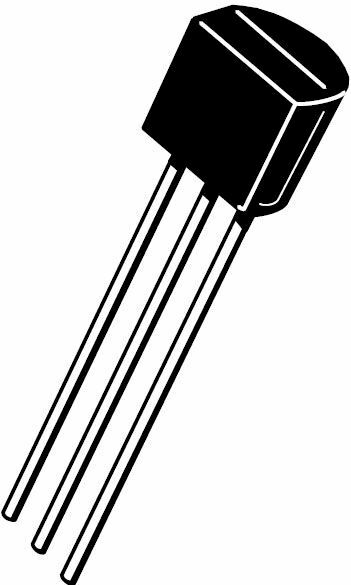 Here a transistor is used to trigger the MOSFET. PWM signals from a microcontroller are used to switch on or off the transistor. A logic low signal from the microcontroller pin results in the OPTO Coupler to operate, generating a high logic signal at its output. The PNP transistor is cut off and accordingly the MOSFET gets triggered and is switched ON. The drain and source terminals are shorted and the current flows to the motor windings such that it starts rotating. PWM signals ensure speed control of the motor. 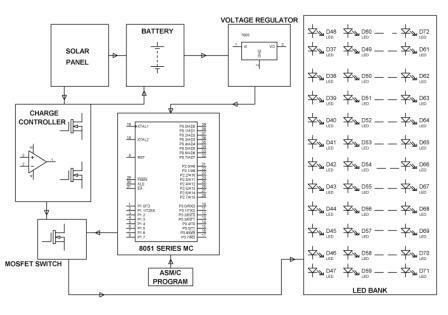 MOSFET operation as a switch involves application of controlling the intensity of an array of LEDs. Here a transistor, driven by signals from external source like microcontroller, is used to drive the MOSFET. 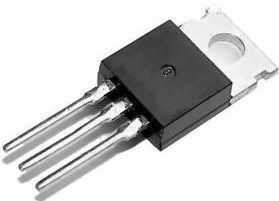 When the transistor is switched off, the MOSFET gets the supply and is switched ON, thus providing proper biasing to the LED array. 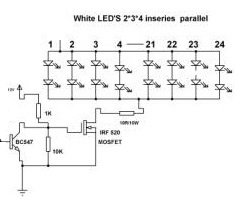 MOSFET can be used as a switch to control the switching of lamps. Here also, the MOSFET is triggered using a transistor switch. PWM signals from an external source like a microcontroller is used to control the conduction of transistor and accordingly the MOSFET switches on or off, thus control the switching of the lamp. We hope we have been successful in providing the best knowledge to the readers about the topic of field effect transistors. We would like the readers to answer a simple question – How are FETs different from BJTs and why they are more used comparatively. Please your answers along with your feedback in the comment section below. 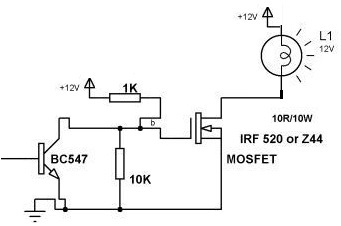 MOSFET is used for amplifying or switching signals.